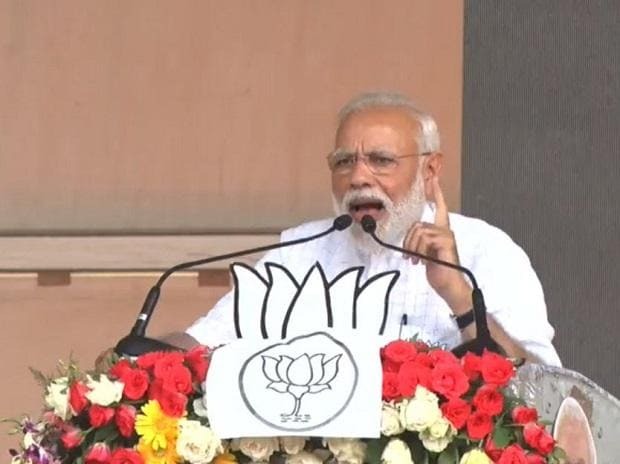 Prime Minister Narendra Modi on Tuesday lashed out at the ruling Biju Janata Dal (BJD) for laying false claims over the hugely subsidised one rupee rice scheme. The subsidised rice distribution scheme has been a major poll plank for Naveen Patnaik-led BJD government in previous elections where outcomes immensely favoured the incumbent government. “The government of Chowkidar in Delhi procures rice at Rs 29-30 per kg and despatches it to Odisha. The Odisha government contributes only Rs 2 per kg to it.. However, they claim that they provide rice at a subsidised rate to the people of Odisha. It's an utter lie,” Modi told packed crowds in Sambalpur. “If your son sends you money order from Delhi and the postman delivers it to you, will it be the postman’s money”, asked the prime minister. He said that the state government must also tell the people that the chowkidar sends them the rice from Delhi. Modi sounded confident after the first phase of polling in the state which was held on April 11. “The indications that have come from Odisha after the first phase of voting are that once again there will be a Modi government in Delhi and a BJP government in Odisha," he asserted . “We amended the old mining law and ensured that a part of the funds from the resources extracted is utilised for the development of local infrastructure. Thus, District Mineral Fund (DMF) was created and Odisha received Rs 6000 crore," Modi said. The DMF was meant to be utilised for construction of hospitals, provision of clean drinking water and building of schools. “You will be surprised to know that BJD government could spend only Rs 1000 crore and the balance is lying un-utilised. People here are worried over petty needs. If such is the intent of the government, it should be changed. The people of Odisha have blindly reposed their faith in this government for 20 years. Odisha, now has made up its mind for a change,” he added. Modi said the BJP government will set up separate ministries for fisheries and jal shakti (hydropower) if re-elected to power at the Centre. Later in the day, Modi was given a rousing reception during a roadshow in Bhubaneswar that lasted for more than an hour. Accusing the BJD for running a coterie, Modi said while on the one hand, the BJP is working on the mantra of Sabka Saath Sabka Vikas, the BJD government was engaged in the enrichment of some relatives. “The central government has left no stone unturned for the development of Odisha. An investment of about Rs 3 trillion in five years has been made on its infrastructure. More than five times the amount has been given by the previous government," he added. Taking a jibe at Congress, Modi said that the party had hatched a conspiracy to destroy tradition by linking Hindus to terror. “From 2004 to 2014, the remote controlled Congress created an environment that it became a sin to talk about culture and tradition,” he bemoaned. "The Congress and its associates have lost credibility and the people's faith in the country. The public today believes that for the first time there is a government in Delhi which is working sincerely for the development of the country," the prime minister asserted.